Over the last few years I've been trying to learn more about New Zealand's role in the nineteenth century Pacific slave trade. I've lectured in Tonga about the slave raids on that country in 1863, and Bridget Williams will be publishing my book on the subject in December. I've also been trying to learn about the Melanesians who were brought to New Zealand as indentured labourers in the later decades of the nineteenth century. About sixty thousand Melanesians, almost all of them from Vanuatu and the Solomon Islands, were brought to Queensland to toil in that state's sugarfields in the nineteenth century. 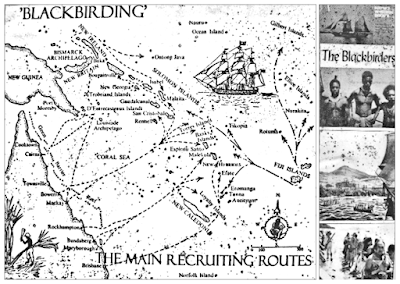 Today, the descendants of some of these 'blackbirded' labourers make up Australia's South Sea Islander community. In Vanuatu and in the Solomons many families remember ancestors who suffered in Queensland. Historians have told the story of Queensland's bonded labourers in essays and books and documentary films. But the stories of the Melanesians who were brought to New Zealand have seldom been told. Only a relatively small number of Melanesians came to this country, and few of them stayed here permanently. But their presence prompted debates in the media and in parliament, and led to the creation of an historic set of photographs. Next month I'll be travelling to Vanuatu. I'm hoping to place a set of papers relating to New Zealand's Melanesian labourers in the archives of the famous Vanuatu Cultural Centre. The largest group of Melanesian labourers arrived in New Zealand in 1870 from the island of Efate. Reproduced below is a timeline that tries to explain how and why the Efateans came to New Zealand, and what they experienced here. The timeline is still very incomplete, and I've sprinkled it with research questions. The Daily Southern Cross reports that a ‘large scale’ flax mill will soon be built by ‘Messrs Walker and Reid’ in the Hokianga. The mill will stand at Waiarohia, a place halfway between Opononi and Omapere near the southern head of Hokianga harbor. Many mills are being built around the country, as prices for flax rise overseas. The New Zealand Herald reports that Walker and Reid have held a large party to celebrate the opening of their mill at Waiarohia, and notes that the two men already have access to eight hundred acres of flax plants. A schooner named Lulu is launched at Onehunga’s port, in a ceremony attended by some of Auckland’s wealthiest businessmen. The daughter of Thomas Russel, a key proponent of the Waikato War and the founder of the Bank of New Zealand and the legal firm Russel McVeigh, has the honour of breaking a champagne bottle against the boat’s hull. Francis Cadell, an early explorer of Australia’s rivers who commanded a ship during the Waikato War, is named as the owner of the Lulu, though it is unlikely he would have been able to pay for the ship’s construction. Cadell will soon return to Australia, and in 1876 he will be arrested and removed from Western Australia for enslaving Aboriginals. The Auckland businessman Edward Brissenden leases nearly four hundred acres beside the Waitakere River in the Te Henga area of West Auckland. Brissenden will spend eight months building and running a mill on the land, before a legal challenge to his right to lease the land forces him to end operations. After making a few voyages along the New Zealand coast, the Lulu leaves Picton bound for the New Hebrides. The schooner carries a man named Young, who is charged with recruiting workers for Edward Brissenden’s flax mill at Waitakere. The Lulu stops at Norfolk Island on the 22nd of March, and reaches Noumea two days later. The Governor of New Zealand, Sir George Bowen, tours Northland, and takes a cruise down the Hokianga harbour. Reports of Bowen’s cruise mention that the other passengers in the boat recognised the flax mill of Waiarohia as they moved towards the heads of the harbor. The Lulu reaches Aneityum, in the far south of the New Hebrides. The locals refuse contact, and so the vessel continues to Tanna, which it reaches on the 9th of April. Large numbers of Tannese board the ship to trade, but they refuse offers of recruitment, so the Lulu pushes on to Efate, which it reaches on the 13th. But the Efateans, too, refuse recruitment, telling the Lulu’s crew that they have been mistreated after journeying to Australia to work. Two Tannese and one Efatean do join the ship as interpreters, and chiefs at Efate agree to produce recruits in exchange for rewards. The Lulu encounters a schooner from Sydney called the Zephyr, which has been trying unsuccessfully to recruit labour for Fiji’s canefields, then moves north, through the small islands near Efate to Ambrym, Malekula, and Pentecost. At Pentecost crew members land to try to recruit, but have to retreat when arrows are fired at them. They escape without injury, and the Lulu returns to Efate. On the 27th of April, at Havannah harbour, nine men board the ship. Twelve men join the boat at Mele Bay, and two at Pango peninsula. 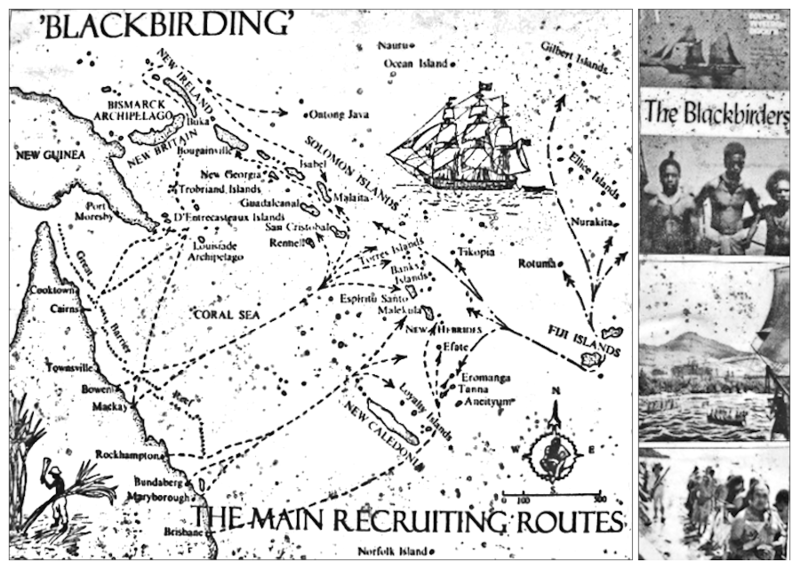 The Lulu sails south with twenty-seven recruits, stops at Tanna to pick up a European passenger named Miss Chapman, then leaves the New Hebrides. John Coleridge Patteson, the Anglican Bishop of Melanesia and a loud opponent of blackbirding, arrives in Auckland to recover from an illness. Patteson is soon living with Governor George Bowen in central Auckland’s Government House. At least one of Patteson’s biographers has suggested that he was aware of the controversy around the Lulu’s voyage that began after the ship arrived in Auckland in May 1870. Question: did Patteson influence Bowen’s attitude to blackbirding? And do documents that show him intervening in the arguments about the Lulu and its passengers survive in the massive archive at the Kinder Library of St Johns theological college in East Auckland? The Lulu arrives at Auckland’s Waitemata port. According to a report in the Daily Southern Cross, it carries ‘twenty-seven South Sea Islanders’ who ‘are to be employed at a flax mill in Waitakere’ for a ‘period of three years’ after which ‘they must be returned to their homes’. The Daily Southern Cross publishes a very long and detailed account of the journey of the Lulu, which it says is based upon a diary kept by ‘Captain Ponsonby’ whom it describes as the ship’s ‘navigator’. Ponsonby admits that the Lulu’s crew used ‘douceurs’, or bribes, to secure labourers from Efate and Nguna, after visiting all of the major islands of the New Hebrides and failing to recruit workers. Question: how far can we trust this text, when we remember that other New Zealand mariners involved in blackbirding, like the notorious Thomas McGrath, who took slaves at two Tongan islands in 1863, offered false details of their voyages to the media? On the other hand, does Ponsonby’s apparently incriminating admission of bribery suggest that he was being honest? The Daily Southern Cross editorialises against ‘the introduction of contract labourers from the South Sea Islands to New Zealand’, claiming that it is ‘impossible to suppose’ the men on the Lulu came here ‘voluntarily’, and predicting that these ‘Pagan and Debased’ visitors ‘will toil at their masters’ mills’ and be ‘scantily fed and clothed’. The Daily Southern Cross publishes, under the headline ‘Polynesian Labour for Auckland’, a letter condemning imported South Sea Island workers as a threat to the economy of New Zealand. According to the correspondent, who signs himself Operarius, which is Latin for ‘Worker’ or ‘Working’, South Sea Islanders are not paid enough and do not spend enough time in their host countries to stimulate the economy there. New Zealand can only become prosperous if it imports white workers, lets them stay permanently, and pays them reasonable wages. Question: was Operarius expressing the views of New Zealand’s embryonic trade union movement? We know that, during the early decades of the twentieth century, New Zealand’s unions frequently took an anti-immigrant line, supporting the White Defence League and at one point warning of the danger of indentured labourers from Niue. Wellington’s Evening Post editorialises against the importation of South Sea Island labourers to New Zealand. The Post compares the labourers imported by the Lulu to slaves, and calls for legislation, so that the importation of more labourers can ‘be nipped in the bud’. Sir George Bowen, the Governor of New Zealand, sends a dispatch to London describing the arrival of the Lulu and expressing opposition to the ship’s mission. Bowen attaches a memorandum from New Zealand Premier William Fox promising an investigation into the Lulu and into the issue of imported labour. After the closure of the mill at Waitakere, eleven of the ni-Vanuatu are sent to the flax mill Walker and Reid are running in the Hokianga, while twelve are despatched to Puriri, a settlement near Thames, where Edward Brissenden has another mill. The Daily Southern Cross published a letter that claims ‘a certain schooner’ is about to leave New Zealand for the islands on a blackbirding mission. The correspondent, who signs himself ‘Old Colonist’, threatens to publish the names of the ‘parties’ to this venture. The New Zealand Herald publishes a long article called ‘Disgusting Results of Imported South Sea Labour’. The Herald suggests that the ‘niggers’ brought to Auckland on the Lulu may have been kidnapped. Instead of showing sympathy for the ni-Vanuatu, though, the Herald condemns them as ‘woolly barbarians’ whose ‘manners and faults’ are an ‘outrage’ to New Zealand. The Herald claims it has received letters that describe the South Sea Islanders exhuming the bodies of animals that have died from disease, and devouring these animals ‘greedily’. It also repeats claims that the islanders have ‘scoured the creeks and landed putrid carrion’ on which ‘they have feasted exaltingly’. The Herald suggests that the islanders’ employers have not looked after them, and that they have become ‘naked and depressed’ and a ‘public nuisance’. Question: is the Herald’s disturbing article evidence that the ni-Vanuatu had been neglected, or even abandoned, in the middle months of 1870, when the flax mill where they were supposed to work at Waitakere was closing down? A fire so bright that it can be seen from Auckland destroys Edward Brissenden’s flax mill at Puriri. The Thames Star reports that the gutted building ‘was of large extent’ and employed ‘about thirty men, besides boys’. The Star says that ‘one man was severely burnt on the hand while trying to save some property’. An article in the Daily Southern Cross says that ‘employees of the mill…rendered valuable assistance’ during the struggle against the fire. The ni-Vanuatu who had been labouring at Puriri are relocated to Auckland, where they are put to work on the Kohimarama estate of businessman JS McFarlane, who was a guest at the launch of the Lulu, and at the Epsom residence of Edward Brissenden. Three of the men – ‘One o’clock’, ‘Charley’, and ‘Monday’ – were eventually moved north to the mill at Waiarohia. Question: was it a ni-Vanuatu labourer who was badly burned? A roundup of news from the Hokianga published in the Daily Southern Cross mentions that ‘Walker and Reid’s mill continues to turn out a few tons occasionally’, and suggests that ‘if this establishment, with its South Sea Islanders as labourers cannot be made profitable’ then the flax industry has little future. 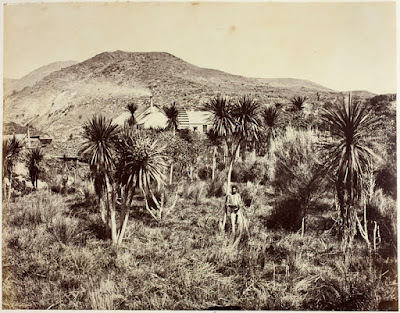 Daniel Louis Mundy, one of New Zealand’s few professional photographers, makes a tour of Northland in search of images, and stops at Waiarohia long enough to take a number of photographs at the flax mill. The mill’s ni-Vanuatu workers appear in a number of Mundy’s photographs. Mundy does not mention the ni-Vanuatu in the titles to his photographs, and they often seem present simply to give his portraits of flax plants and machinery a sense of scale. The Lulu, which had been busy moving labourers to and from Fiji, hits a reef off Espiritu Santo and is wrecked. No labourers are aboard the ship when it founders. The crew boards a lifeboat, which is soon approached by canoes filled with hostile islanders. After avoiding arrows, the crew of the Lulu puts ashore at Lisbon Point mission station and are rescued by the Presbyterian ship Dayspring, which is anchored there. Coleridge Patteson is killed on the small island of Nukapu by locals taking revenge for a recent blackbirding raid. Patteson’s death prompts an outcry against blackbirding in Australasia and in Britain, and new laws are soon passed to try to end the practice. Often, though, these laws will be poorly enforced. A ni-Vanuatu labourer identified as ‘Kuri’ dies of consumption at Waiarohia. Local coroner and magistrate Spencer von Sturmer had been giving Kuri medicine, and records his death. John Thomson, head of Auckland’s armed constabulary, submits a report to the New Zealand government after visiting the ni-Vanuatu working in Auckland and in the Hokianga. Thomson describes the huts the labourers have built in the Hokianga as an alternative to the accommodation their employers offered, and explains how they supplement their rations by gardening and fishing. Thomson considers that the ni-Vanuatu are ‘comfortable’, but relays their complaint that they have been made to work too long in New Zealand. They seem to have believed they were obliged to work for one year, but their employers insist they signed up for three years. Thomson does not consider that he has the authority to remove the men from their employers. His report is forwarded to Governor Bowen. The Daily Southern Cross carries an account of a visit to the Hokianga. The anonymous traveller visited the flax mill at Waiarohia, and was given a tour by its manager, ‘Mr Charles Clark’, who explained that he had been using ‘South Sea Islands labour’. These workers had been ‘very comfortable’ in the Hokianga: they are ‘going on a trip’, but some ‘want to come back…bringing their wives with them’. Before they left, the South Sea Islanders ‘favoured the locals with some of their dances’. Questions: how can this report be reconciled with the complains the ni-Vanuatu made to Jon Thomson about the length of time they had been made to work in the Hokianga? Which dances would the ni-Vanuatu have performed, and what would their meaning have been? Can we get a sense of the dances they would have performed by reading the accounts of Efatean culture produced late in the nineteenth century by missionaries like Daniel McDonald? The New Zealand Herald reports that ‘about a dozen South Sea Islanders left a few days ago in the schooner Colonist’ after having ‘served periods from one to three years in this province – principally in the flaxmills at Hokianga and Waikato’. The Herald claims that the men are ‘satisfied’ with their lot, and says that some of them plan to return to New Zealand. It reports that before leaving on the Colonist they ‘laid out what money they had’ to buy goods that would be valuable in the islands. The Herald, which only a couple of years earlier condemned the South Sea Islanders as ‘woolly barbarians’ concludes its article with the sanguine sentence ‘they came here penniless, but go back traders on a small scale’. Question: what goods did the honeward bound South Sea Islanders buy? Often labourers returning from the plantations of Queensland would send their precious wages on guns, which were scarce and very valuable in Melanesia. The photographs that Daniel Mundy took at Waiarohia are included in New Zealand’s contribution to the Vienna International Festival, a huge event modelled on the Great Exhibition held at London’s Crystal Palace in 1851. The Colonist returns to New Zealand, putting in at the Port of Russell because of ‘stress of weather’. Question: did the Colonist succeed in dropping the men of Efate and Nguna home? Efate was enjoying a period of peace in the 1870s, and in the area around Port Havannah, where many of the labourers had embarked, palangi newcomers had established relatively good relations with locals. It may well be, then, that the Colonist was able to complete its mission. Marvellous project, Scott - I really look forward to hearing the outcome of your trip to Vanuatu. One suggestion - bear in mind the curious overlap between the occupations of blackbirder and Crown land purchase agent, ie. the gents who bought Maori land, usually in vast acreages, on behalf of the government of the day. Edward Brissenden was one of the most active of these agents in Northland in the mid-1870s. He was paid on commission, which encouraged him to complete purchases as swiftly as possible. He bragged that he often paid the owners less than half what they might have received from private buyers, and was dismissed for unscrupulous conduct in 1876. His assistant was the even more colourful Charles Nelson, believed to have worked on Brazilian slave-ships before coming to NZ and later also thought to have his fingers in the blackbirding trade. Thanks for the tip about Nelson. I haven't chased him.